Home > Shop By Brand > GTechniq Exterior Coatings > GTechniq L1 Leather Guard AB 100 ml. GTechniq L1 Leather Guard is the solution to one of the most prevalent issues with leather surfaces – friction and staining. 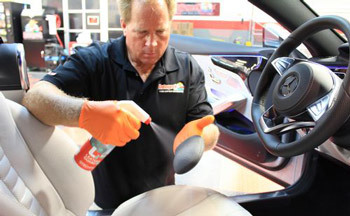 GTechniq L1 Leather Guard creates a clear protective coating on leather seating surfaces that resists soiling and dye transfer from blue jeans along with the normal wear and tear associated with getting in and out of your vehicle on a daily basis. GTechniq is cheap insurance for keeping one of the most costly options available in new cars today – leather trim – protected and looking new. GTechniq L1 Leather Guard is one of the best investments in car care if you own a vehicle that has leather throughout the interior. This advanced coating dries clear and provides a durable, protective shield that resists body oil, friction and dye transfer from blue jeans. GTechniq refers to this technology as an “anti-stain function” and no other manufacturer except GTechniq utilizes it. Spray GTechniq Leather Guard AB directly onto an applicator, we recommend the Black Fine Flex Foam Finger Pockets, and apply an even layer of product for an all over protection. GTechniq L1 Leather Guard lasts considerably longer than conventional leather protectants because L1 Leather Guard actually bonds to the surface. GTechniq L1 Leather Guard dries to the touch and it doesn’t make leather surfaces greasy or slippery; you won’t even be able to tell that it’s there! GTechniq L1 Leather Guard only needs to be applied twice a year for maximum protection. 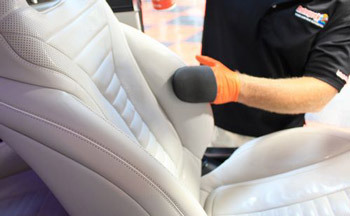 If your vehicle’s leather seats have piping or high-bolstered sport seats, L1 Leather Guard should be applied once every 3 months for maximum protection. GTechniq Crystal Serum LightGTechniq Crystal Serum Light 50 ml.GTechniq EXO and CSL KitGTechniq EXO Ultra Durable Hybrid Coating 30 ml. New & Improved v4!GTechniq EXO Ultra Durable Hybrid Coating 50 ml. New & Improved v4!GTechniq C1 Crystal Lacquer 30 ml.GTechniq C1 Crystal Lacquer 50 ml.GTechniq C1 Crystal Lacquer 250 ml.GTechniq C2v3 Liquid Crystal 500 ml.GTechniq G-Wash 250 ml.GTechniq G-Wash 500 ml.GTechniq Quick Detailer 250 ml.GTechniq Quick Detailer 500 ml.GTechniq I2 Tri-CleanGTechniq G4 Glass Nano Polish 100 ml.GTechniq L1 Leather Guard AB 500 ml.GTechniq C6 Matte Dash AB 100 ml.GTechniq I1 Smart Fabric 250 ml. New & Improved!GTechniq I1 Smart Fabric AB 500 ml. New & Improved!GTechniq G1 Clear Vision Smart Glass 15 ml. Been looking for a good protectant for treated and untreated leather with a matte finish. Applied to shop chair leather top as trial before putting on seats and vinyl interior trim. Goes on easily and darkens slightly (was red treated leather or vinyl) but nice finish. Applied on untreated leather (old coat) and darken more but still finished nicely. ProsEasy to apply. Nice matte finish. ConsDarkens a bit more than other products on treated leather. Untreated leather tends to leave a dull finish (no shine).